A new undercover investigation by our field officers in South America has exposed more horrific abuse in circuses. As we released the horrific footage of the Great British Circus elephants in the UK, our South America team were filming horrifying abuse of tigers during training in a circus in Chile. The team moved on to Colombia and Brazil, where we filmed more scenes of suffering and deprivation. The UK, Europe, USA and South America: animal abuse in circuses is endemic. 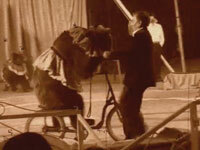 It is part of the working culture in circuses, worldwide. The circuses are making it harder to get behind the scenes, but we continue to get the facts. Only a ban will stop the cruelty. Our latest evidence became the core of a new ADI film called ‘Unnatural Acts’. This also utilised evidence from our previous South American investigations, making it the most comprehensive documentary about the South American circus industry ever made. Tigers beaten repeatedly and having stage props hurled at them during training. Tigers and monkeys living in trucks, in deplorable conditions. Disturbed, stereotypical behaviour in horses, camels, and a poor baboon called Maika pacing on a short chain. Our previous investigations and campaigns led to a ban in Bolivia and bans are being tabled in Brazil, Peru, Colombia and Chile. We hope that ‘Unnatural Acts’ will drive forward these bans. We have staged screenings of the new video in the Congresses of Peru, Brazil and Colombia. The video and evidence specific to the circuses in Chile is being presented to the Chilean Government as we go to press. Unnatural Acts begins with a series of scratchy sepia toned images, as if the viewer were watching scenes from days gone by. There is then the shocking revealation that these are all current day circuses - with some footage filmed during our investigation just weeks before the launches. The video goes on to contrast the lives of animals in the wild with sumptious wildlife footage set against the confinement and brutality fo the circus. To date three Spanish versions have been produced for Peru, Colombia, and Chile and a Portuguese version for Brazil – each version refers specifically to legislative moves in that country. We hope to produce an English language version in the near future.